11.54.070 Public hearings and approval. This chapter establishes the process for the preparation, adoption, and amendment of a specific plan. The specific plan provides a tool for the development of more specific land use, infrastructure, and/or design or development standards for properties requiring special treatment or consideration. The specific plan is a policy and regulatory tool for implementation of the goals and policies of the South Gate general plan. The provisions of this chapter shall apply to the preparation, review, and adoption of all specific plans prepared for all real property within the city of South Gate. The standards of this chapter, and eligibility for a specific plan, shall only apply to projects composed of a minimum of five acres of contiguous property. Any project of less than five acres shall not be eligible for a specific plan. A. Applicant-Generated. The preparation of a specific plan, and concurrent zoning and/or general plan amendment(s), may be started by an applicant or property owner. The use of a specific plan is appropriate where site-specific regulation beyond the scope of this title would be beneficial based on site features or unique characteristics of the property, such as innovative development in the form of buildings, construction, design, or use combinations inconsistent with the established provisions of this title. B. Compatibility. All uses shall be compatible with the intent of the South Gate general plan and this title; maximum development intensity/density shall be consistent with the general plan. C. Regulating Document. A specific plan may either supplement or supersede land use regulations of this title, including all previously adopted ordinances, standards, and guidelines. Upon adoption of a specific plan and requisite zoning/general plan amendments, the specific plan shall replace and take precedence over the zoning regulations of this title for the subject property. Maximum intensity and density thresholds shall be consistent with the general plan. Where the regulations of a specific plan are silent, the zoning code regulations and all adopted ordinances, regulations, standards, and guidelines of the city shall apply, as deemed appropriate by the director. A. Purpose. State the relationship to the goals and policies of the general plan. B. Setting. State the existing and regional setting to establish the conditions and reasons for the project. C. Proposed Land Uses. Establish the distribution, type, definitions of, and regulations for all proposed land uses. 7. Signage requirements, if different from the standards of this title, to be addressed by a unique sign program codified in the specific plan. E. Site Planning. Establish a comprehensive map of all streets, open spaces, private and public property, and land uses for all affected properties, consistent with the intent of the general plan and this title. 1. Provide site planning at the perimeter of the area boundaries for the mutual protection of the specific plan and the surrounding properties. 2. Site orientation to use available solar, wind, and natural setting benefits of the site, and to retain natural features and amenities found on site. 3. Provide landscape architectural concept plans and standards, including project entries, streetscapes, fencing details, lighting, signage, utilities, and street furniture. F. Infrastructure. Identify the proposed distribution, extent, intensity, and location of major components of public and private circulation/transportation, drainage, energy, sewers, solid waste disposal, water, and other essential facilities proposed. 1. Include physical and fiscal plans for the construction, improvement, or extension of transportation facilities, public utilities, and all other public facilities/services required to serve the specific plan area. 2. All public rights-of-way within or abutting the development shall remain within applicable city specifications. 3. Include layout and design of private streets and alleys; such private facilities shall be privately owned and maintained without public cost and maintenance responsibility for their intended purpose. 4. Consideration of other forms of access, such as pedestrian ways, paseos, courts, plazas, driveways, horse trails, bike trails, or open public parking areas may be made at the time of specific plan consideration by the city. G. Maintenance. Provisions ensuring the continued maintenance of private property, grounds, and all common areas. H. Phasing. Development phasing for the full life of the project and anticipated schedule, including start date and completion of each construction phase. I. Text and Graphics. A textual document incorporating graphics, including an executive summary, detailing all the required content identified in Section 11.53.040, Required findings, and any additional information identified by the director as pertinent to conveying the development intent, standards, and outcomes of the specific plan. 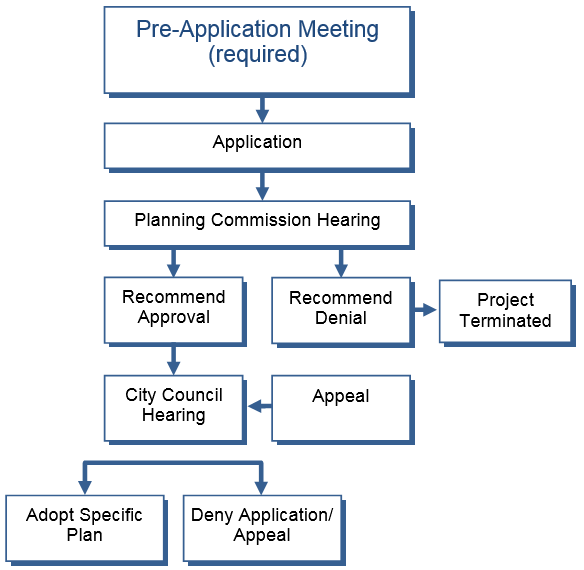 The process identified in Figure 11.54-1, Specific Plan Review Process, shall apply to the processing of all proposed specific plans within the city. The city shall establish the application requirements, which may include a preapplication consultation; review of maps, including constraint and schematic maps; and preliminary development proposal and schedule review. A specific plan, which qualifies as a project under CEQA, shall be subject to environmental review in accord with CEQA; see Chapter 11.50, Administration. A. Public Hearings. The specific plan process is considered a discretionary action. Public hearings shall be held consistent with Discretionary Permit Process B, as established by Table 11.51-1 and Figure 11.51-3, and consistent with all public hearing requirements of Section 11.50.030, Public hearing procedures. B. Approval. The specific plan shall be adopted by ordinance or resolution of the city council, in compliance with state law (Section 65453 of the California Government Code). The city council’s action to adopt a specific plan shall be accompanied by findings that the specific plan is in conformance with the goals, policies, and objectives of the general plan and other adopted goals and policies of the city. C. Incorporation upon Approval. Upon specific plan approval, the zoning map shall be updated by the city. The specific plan as modified and approved by the city council shall be incorporated into this title upon adoption. D. Specific Plan Fee. The city council may impose a specific plan fee surcharge on development permits within the specific plan area, in compliance with state law (Section 65456 of the California Government Code). E. Action Extension. The time within which the planning commission or city council shall act on an application for a specific plan, beyond the stipulations of Chapter 11.50, Administration, may be extended by the city council. A. Process. A specific plan may be amended in the same manner as a zoning amendment, subject to the process and required findings established by Section 11.50.050, Amendments. B. Initiation. An amendment may be initiated by the city council or by the applicant, provided such an applicant has, at the time of application submittal, demonstrated a controlling interest in the development or management of uses within the specific plan area.